This is such an interesting topic. Some people suggest roundabouts and traffic circles as if they are the answer to every traffic problem in the city. It’s simply not true. It depends on the volume and direction of the traffic flow. Traffic circles can be very pedestrian friendly. I use the one at 10th and walker all the time as a driver and a pedestrian. I wonder if the person writing that article ever walked around a traffic circle. When I want to cross the street leading to the traffic circle it is completely natural to walk to a location where the street is smaller in width, ie NOT at the location where the incoming street touches the circle. There is typically much more traffic in the traffic circle than on any of the roads approaching it. Also if you cross further from the circle you can actually tell if there is a car coming off of the traffic circle and you have time to get across the street (or not). That said the circle at 10th and Walker is only 1 lane. 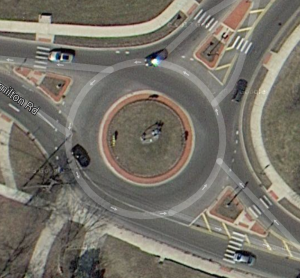 When traffic circles get bigger than that, they become scary (for drivers and pedestrians) in my opinion. As for traffic calming, maybe it wasn’t meant to calm traffic as much as it was to keep traffic moving. What would be the point of having stop signs here if there isn’t that much traffic at this intersection? We used to have stop lights at 10th and Walker, but the traffic circle is more efficient because nobody is forced to stop there in the morning anymore. It’s so much more efficient in time for drivers and money for the city not having to maintain 4 stop light structures. Now we have a garden instead. I totally agree traffic circles do provide a great opportunity for public art.